« Winter is coming: check your Dock Seals. Akro-Mils has introduced a great new product that will enhance Lean and 5S functions. The IndicatorÔ bin is two colors! The largest section of the bin is one color, for standard stock. The smaller portion is bright orange. This allows safety stock to be placed in that section. When the inventory is low in the bin, the operator can just flip the bin to the orange side. This allows them to keep working by having safety stock readily available, but also serves as a visual signal that replenishment is needed. The bin is also unique because it is designed to be picked from both ends. They have also integrated a rolled ridge design to kick up the capacity of the bins. There are big areas for labels on each end of the bin. 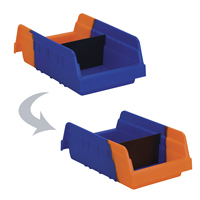 The bins come in two sizes and are made to work on 12″ steel shelving, 14″ wire shelving or pick rack systems. It’s a great way to improve handling without a really expensive inventory control system. That’s effective inventory control at a glance. This entry was posted on November 16, 2010 at 8:52 pm and is filed under Material Handling. You can follow any responses to this entry through the RSS 2.0 feed. You can leave a response, or trackback from your own site.